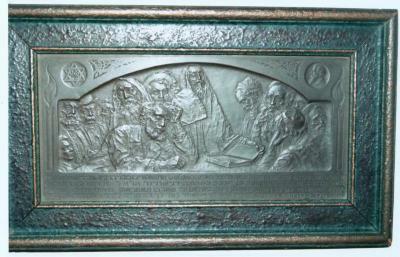 Bronze plaque depicts men covered in tallesim (prayer shawls), praying. Border contains frame within a frame, with arched area in which bas relief picture is enclosed. Circular medallions at the upper left and right of the pictures Jewish star, and a profile bust of Theodore Herzl. Hebrew inscription below picture is the prayer, El Malei Rahamim, in memory of Theodore Herzl’s passing in 1904.